Stirrup Cups first appeared in the 1760’s and were modelled as the head of a fox. The open end was of near oval form but this became more circular towards the end of the century. These 18th century cups were always hand raised and often quite comical in expression. The vast majority were foxes but a hare of 1777 is known . By the late Regency period stag’s heads appeared and for the first time makers like Paul Storr produced them by casting. These tended to be more realistic and have much greater definition but it wasn’t until the mid-Victorian era that a whole variety of animals started to appear. Makers like John Hunt, James Barclay Hennell , George Fox and the Barnard Brothers produced some stunning examples in the form of Hares, Dogs, Bulls, Boars, Horses and even a Gorilla! 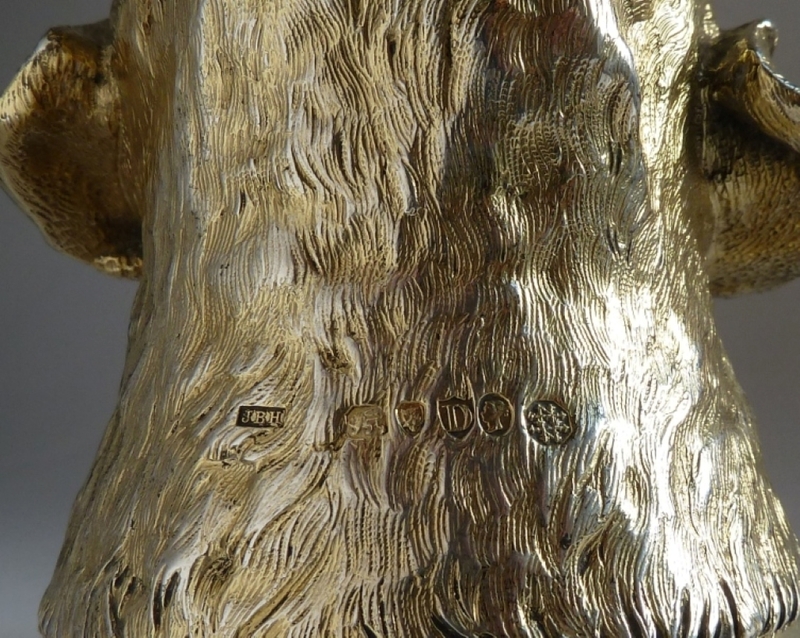 These unusual and heavily cast cups are the ones most prized by collectors. The James Walker Collection sold by Christies South Kensington on13th July 2006 included examples of a Greyhound, 1878, (sold for £16800 inc. premium), a Fox hound’s head, 1880, (sold for £18200 inc. premium) , a Bulldog, 1877, (sold for £21600 inc. premium) and one modelled as the head of a Pointer, 1856, (sold for £19800 inc. premium). 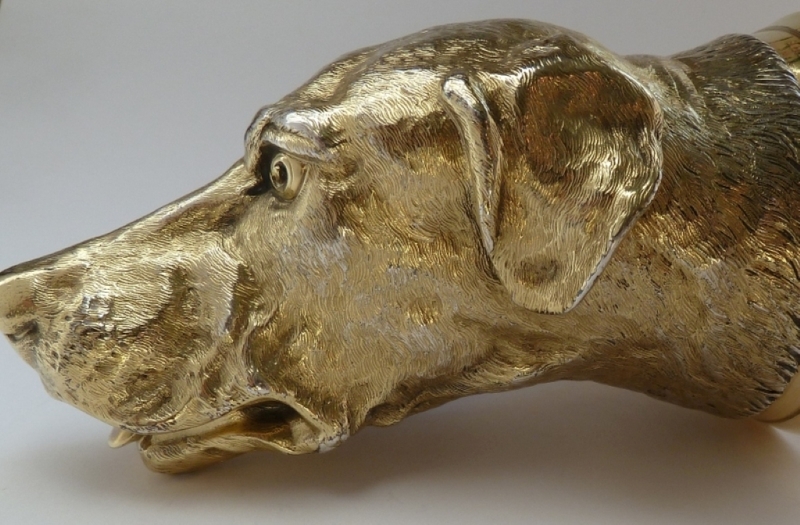 The fine silver-gilt example we have for sale may well be a Pointer but despite having consulted a few leading authorities in the dog world there are various opinions as to which breed it is. Much of the problem being that over 150 years certain breeds have changed dramatically. 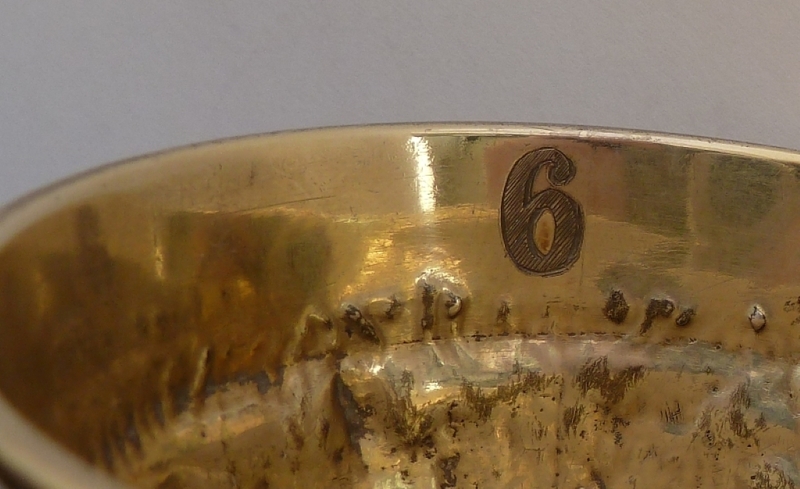 It is engraved on the inside of the rim with the number 6, possibly suggesting that this was part of a set.